In audio electronics, the Total Harmonic Distortion (THD) is one of the most fundamental measurements. Ideally you want to measure it throughout the entire audio frequency range. However, commercial analyzers are very expensive, and normally outside the range of the typical DIY maker or engineer. This project aims at designing a circuit that can perform THD measurements at the frequencies 1kHz and 20kHz. These frequencies are often used when measuring and comparing performance. The circuit requires some manual procedures and tuning, which is described in the User Manual. 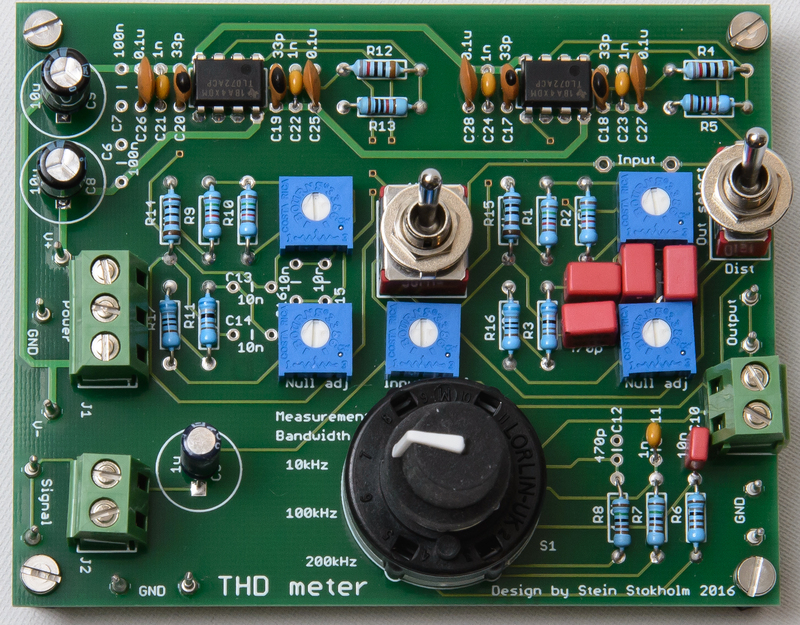 For a DIY audio circuit constructor, the need is not necessarily to have accurate absolute values of THD. At least in my experience the main need is to be able to compare circuits at different development stages to confirm that the improvements you do to the circuit is actually an improvement. If you do measurements on different versions of a circuit under equal conditions even a simple circuit could have sufficient precision to measure and document the (hopefully) improved performance. On the other hand it would probably not be much point in comparing your measurement result with published values of other circuits/devices. 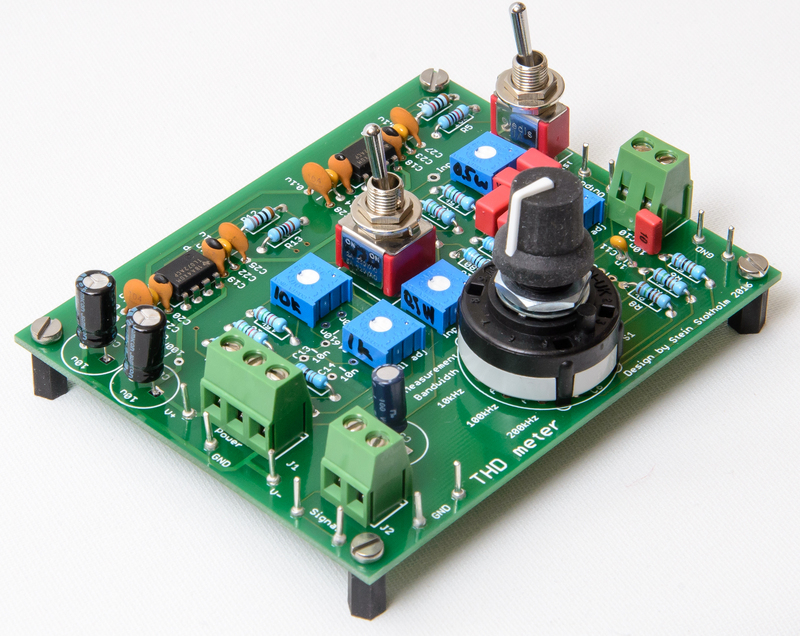 The board consists of two separate subcircuits, one for each of the measurement frequencies. A manual swich is used to select the measurement frequency. In addition, three alternative measurement bandwidths can be selected with a switch. The measurement bandwidth for THD is usually between 80kHz and 200kHz [Cordell] p. 463. The 1kHz-circuit in [Marston p. 70] has a measurement bandwidth of 10kHz. In this circuit the user can select between three measurement bandwidths; 10kHz, 100kHz and 200kHz. The circuit has been analyzed, designed and a first version is built and roughly verified. Improve/complete the User manual section of the documentation, with pictures and possibly video of the measurement procedure. Verify the accuracy of the measurements. Not sure exactly how, since I have no reference equipment to compare with. Commercial audio instrumentation and measurement equipment is generally very expensive, and outside of the reach of the DIY engineer or maker. This project is a direct result of the desire to create simple, but affordable ways of doing basic measurements of my audio electronics designs. Hopefully, this is only the first step to designing a complete range of simple, but effective audio measurement circuits and devices. 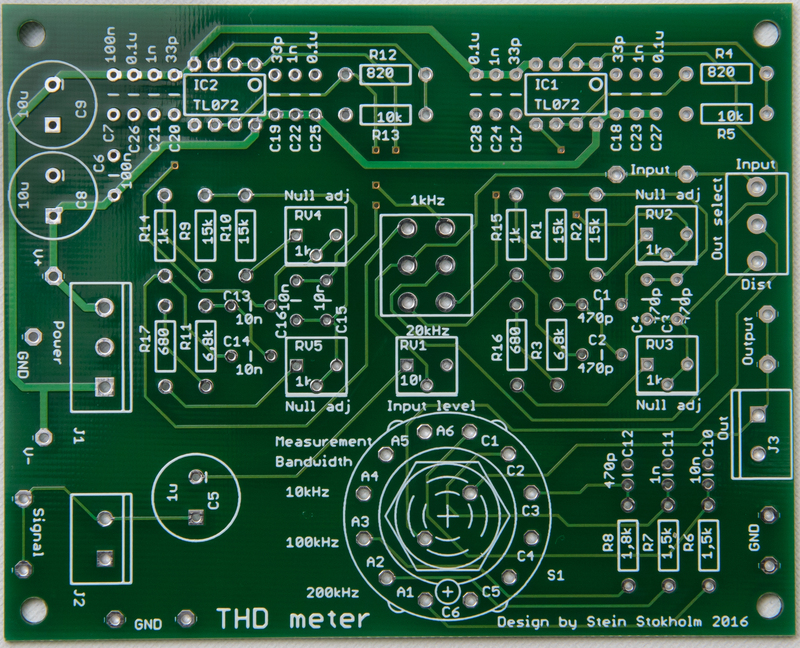 A more complete and user friendly THD analyzer, possibly in the form of a PC board combined with some open source software for doing the maths and display the results in user friendly form. This would make a great Open Source Hardware project!